Review: There's been a Assassin's Creed break for two years now, following the rocky debut of their new engine in Unity and Syndicate. Both those games failed to impress the audience in new ways and Ubisoft felt the need to pull back and give the series a longer development cycle. Leaving the more modern times of revolutionary France and Victorian England behind, Origins is about going back to the series roots and finding out where it all began. This time around we are going way back in history, over 40 years before B.C. in fact, to the ancient Egypt. Have Ubisoft revolutionised the series after a short hiatus one wonders. Well, there's no doubt that this is a AC game. The distinct feeling when walking around, fighting or climbing is very classic for the series. The larger open world this time around reflects itself in the recreation of ancient Egypt where there are cities, but also vast areas of lush vegetation, endless deserts, huge mountains and large areas of water. There's less focus on a dense cityscape, and more about huge nature areas to explore. Not only are the enemy soldiers dangerous, but there's wildlife to consider too. Ubisoft has kind of ended up where they began with the first AC; deserts to roam and cities to discover in the middle east. In this adventure we follow the Egyptian medjay Bayek, a sort of mercenary, in his revengeful task to kill his son's murderers. Along the way he is accompanied by his wife Aya, both on a mission to kill all the people on their list of cruel and corrupt Egyptian leaders in their aim to also set Cleopatra on the throne again. The game is divided into land areas with famous cities and sites from the ancient times; including the pyramids and the lighthouse of Alexandria. The whole map is traversal, but the areas give a hint about which level you should be at before entering them. Origins relies heavily on leveling your character and equipment. I would say it's the closest to an RPG that the AC series has ever been, only without the magic side of that genre. Each level up grants you points to further enhance Bayeks abilities. There are ordinary, rare and legendary weapons to find, plus your armour and equipment can be upgraded with resources you find. This gives the player a purpose to take on side missions and go hunting for materials and animal skins required to craft equipment. I found this whole character leveling system really good, and the resources fairly easy to collect. it also helps that the combat feels satisfying, with proper hit detection and less scripted animations. Sword fights feel intense and the bow shooting is very satisfying, especially the first person bow with controllable arrows! One of the cooler new additions to the game is Senu, Bayeks pet eagle. At any time you can hit the eagle button and bring up a birds view as you control Senu from high above. He can scout for enemies, transports, animals, treasures and mission objectives. Each climb up to a high synchronisation point grants Senu better spotting abilities, a real neat feature. Flying around and taking in the sheer size of the environments is a really welcome addition to the game and fun one at that. It really makes the game engine shine, the sheer size and amount of detail from above is jaw dropping. Which brings me to Origins strongest point; it's incredible immersive world. I'm playing the game on Xbox One X and while the first part of the game feels a tad generic, it's when the game opens up and lets you explore it's vast and detailed world it amazes. The thickness of foliage, fields covered in thousands of flowers and strands of grass, tons of buildings, lakes, open seas, huge mountains and endless dunes of desert sand; just all come together and blow you away. It's truly a beautiful world to immerse yourself into. The sheer density of all the detail in such high resolution when playing it on the Xbox One X is incredible at times, every little corner of the world seems to be filled with detail. I fell in love with the Egypt setting. I found little I disliked strongly in Origins when it came to gameplay and a technical point of view, only a few small issues; the environments seem to have opened up so much that it's not really built for traversing it a high level above the ground with tons of connected buildings. Also the combat has a terrible lock-on mechanism that seems to target the enemy furthest away from you rather than the guy hitting at you, with an axe. As usual some side missions are boring and repetitive, but this is very common in RPG styled games anyway. No, Origins main problem is not the game itself, it's the storyline. It feels bland and non engaging. Bayek seems uninterested in the political changes that Aya cares for and wants Bayek to take part of. His only motivation is to avenge his sons killers, as such the main story with Cleopatra working her way to the throne seems trivial and sidelined. I felt Bayeks pain for his son, but I also felt his indifference towards the larger historical picture. Making the ending feel rushed too late into the game to tie itself with the whole Assassin's Creed main plotline. The build up of the actual secret organisation should have been a larger focus, much earlier in the game. It's sad to see a clear five star game, fall down to a four for me, but the story just brings the whole package down. It's just there with no motivation to take properly part in it, even Bayeks personal goal of revenge towards his sons killers is brought down with some unsatisfying ending cutscenes for their assassinations. I wanted to care for the story, but I didn't and the game didn't make me want to either. 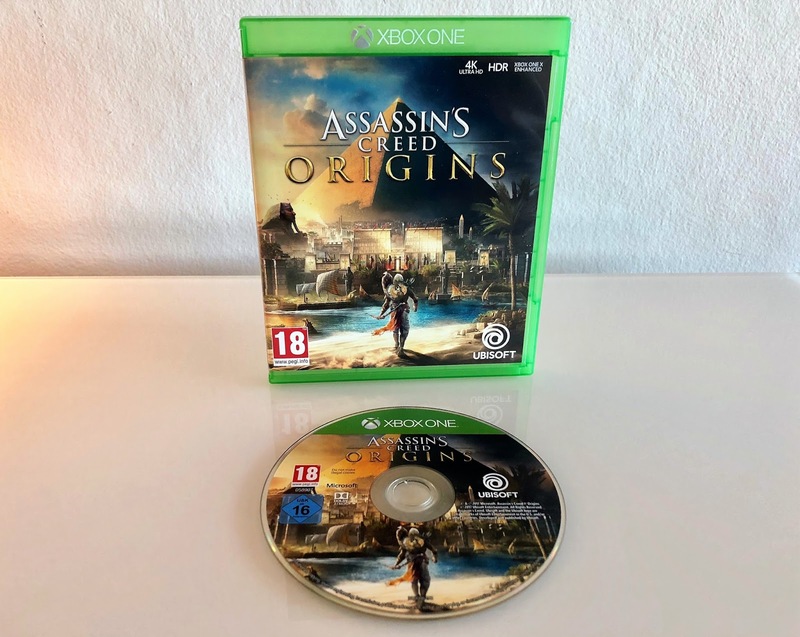 Origins is a warm and welcome return of the AC series after it's short two year hiatus, the gameplay is satisfying and it returns to some of the right design choices; the world is huge and stunningly recreates an ancient era. While it's perhaps not a revolution of any kind, it's an extremely polished AC experience this time around. Sad then, that the storyline is such a let down, but as a videogame alone it's a fantastic game. Newcomers to the series can easily drop in here and play too, it requires no prior knowledge of the lore and gameplay is probably the best of all the AC games.